This powerful training uses John Maxwell training on professional etiquette, developing a team culture, generational differences in the workplace, 5 levels of leadership, effective communication and more. Is a life skill and lifestyle habit. It involves going out in a systematic way and meeting new people in order to build a list of contacts. With power networking, you’re meeting people with a clear goal in mind. However, it’s not an activity you do only when you want something. It’s an ongoing process that creates long-term, mutually beneficial relationships. “Because everything rises and falls on leadership,” says Maxwell. Play the game with 6-12 of your most influential leaders and find out! 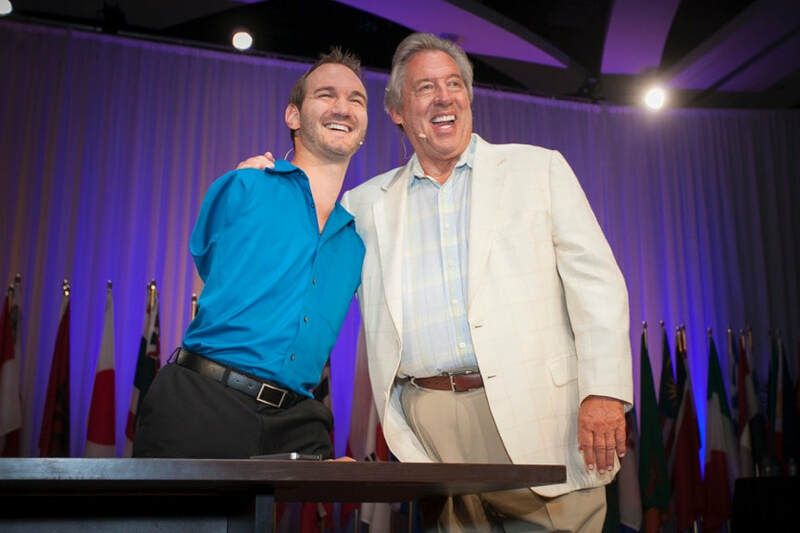 This powerful training uses some John Maxwell material plus more. This covers how to work with different personality styles, professional etiquette, developing a team culture, generational differences in the workplace, 5 levels of leadership, effective communication and more. Learn to be intentional, aware, consistent and curious and learn the power of reflection, design, trade-offs, contribution and more. This book has proven to be invaluable to the CEO, Management, and staff alike. Will make a lasting impact on your ability to lead. This training will focus on four specific areas that can make a lasting difference in your leadership abilities: Relationships, Equipping, Attitude, Leadership. These areas are a challenge to every leader – and while you may readily identify with one or another of them, it is John’s goal that you grow significantly in each area. This course is based on John Maxwell’s personal growth journey. It is filled with stories of his leadership failures and successes and the nuggets of wisdom he gained as a result. If you are an emerging leader you will love the foundation this training provides. Experienced leaders will enjoy the insights and examples and will want to use the materials to develop the next generation of leaders on your team. “The #1 criteria for advancement and promotion for professionals is an ability to communicate effectively.” – Ralph G. Nichols. Connecting is the ability to identify with people and relate to them in such a way that it increases our influence with them. This book is more like a foundational instruction manual. The laws themselves are defined clearly and simply. John will give you specific steps for applying the laws to the leadership in your office, community, family, or church. This book will change the way you live and lead. As you read, you will be encouraged and your ability to lead will expand. He came to the conclusion that leadership is influence. ​'The 5 Levels' has been used to train leaders in companies of every size and configuration, from small businesses to Fortune 100 companies. knowledge to help make yourself into a better leader. forward when you possess the right tools and mindset to turn a loss into a gain. Drawing on nearly fifty years of leadership experience, Dr. Maxwell provides a roadmap for winning by examining the eleven elements that constitute the DNA of learners who succeed in the face of problems, failure, and losses. ​ Everyone can be a leader, but sometimes we must follow first. Team work makes this happen. Not only does my Certification from John Maxwell guarantee a quality seminar or training session, I have over 37 years of coaching and teaching leadership"
​Not only does my Certification from John Maxwell guarantee a quality seminar or training session, I have over 37 years of coaching and teaching leadership. I have developed and honed to razor sharpness, my own proven programs for Personal/Professional Growth, Preparing for College Road Maps for Parents and Their Teens, Leadership Workshops for Teens, Leadership Training in Business, and How to Get The Most Out of Your Potential and Skills. Would you like to achieve greater success in your life? Join John Maxwell Team member Barbara Britt as she shares successes and failures in the journey of discovery, creation and achievement. You will be guided interactively through this signature workshop that will let you discover your own unique living-breathing plan for success. More than just a plan; it will be a Blueprint to clarify your discovery, put words to your vision, and create specific objectives. You will hear Barbara Britt describe the goal making strategy of this workshop along with a process to execute and up level your vision. Your personal blueprint will also help you gain greater clarity, confidence, and the self-image to live your dream while creating a life of significance. Time Management Keys to Self-Management. A recent survey found that the number one characteristic employers want to see in their staff is professionalism. How far you get in your career often depends on how well you manage your time. a. Time management skills could be the single most important attribute in employees. Using Mental Imagery to Reach Goals and Visualization Exercise for Success. Visualization is an incredible tool for personal development. It’s a technique used by elite athletes, writers, psychologists, entrepreneurs, and successful people from all walks of life. Are you truly networking make connections that will help you develop your relationship skills or are you eating out and throwing your business cards at each other. Learn how to build relationships that will increase your business and your effectiveness. TAKE THE GUESSWORK OUT OF INTERACTING WITH OTHERS! What are your chances of connecting well with another person? On average, two people have about a 40% chance of experiencing a good personality match based on how their personality styles naturally fit together. That means that, most of the time, two people are likely to have a built-in challenge in relating well with each other – UNLESS they understand each others personality styles. Personal and business success hinge on effective communication with others. Why GUESS and take your chances in relationships when you can KNOW your personality style and the personality style of those around you? Our personality assessment and report reveals your personality style and helps to guide you connect with others in a much better way. This training is done after Escape Room and last 90 minutes. This session uses the Ultimate Discovery System methodology to provide a personality assessment for each participant. After each participant completes the personality assessment the trainers will walk the group through charting the results, and then utilizing that information to understand the personality assessment for him/herself as well as others in the group. This session focuses on understanding personality types and blends, and the behavioral traits that accompany these traits. An Escape Room debrief will be part of this program. This is a 2 hour course after the Escape Room challenge. This session builds upon the Ultimate Discovery Systems described above and adds The DISC Advantage take home book. This allows extensive knowledge on how to utilize our unique blends so that we can work in our strength zone, while allowing others on our team to do the same. You will be able to utilize exercises to apply the information discovered through the personality assessments. Making this process a must have for upward, sustainable growth for the individual/team. ​With this program you have the opportunity to select two extra training programs to fit your unique needs. You will also be eligible for our Bonus Program within the first 3 months of your training significant savings. The bonus program allows you to select training to enhance the growth of your team as well as each individual on it. Your business cannot grow unless everyone grows. ​This is a 3 hour course after the Escape Room challenge, which includes everything from the Premium level plus one additional exercise. ​​This is a highly interactive program allowing your team to experience real time situations. You will also be eligible for our Bonus Program within the first 3 months of your training for a significant savings. The bonus program allows you to select training to enhance the growth of your team as well as each individual on it. Your business cannot grow unless everyone grows. Time Management – Because you can’t increase the number of hours in a day, making the most of your time is an essential skill to develop and practice. In a recent survey it was found that the number one characteristic employers want to see in their staff is professionalism. Networking Development – How to promote yourself for entry into the Chamber and/or Business world. How to build relationships to increase your business, and others success. Conflict Resolution – Why spend time in an unproductive manner, when knowing and respecting each others differences allows us to create a new reality where everyone realizes where they belong. Dreamer/Witness-Status Quo – How to articulate your goals and dreams while working through the brain chatter or doubts others bring to life. Negotiating Skills coupled with Listening techniques can increase the cooperative attitude of your staff. Powerful Listening Activity that demonstrates using real life skills in listening can increase the power of building relationships and increase team building cohesiveness. Attitude Determines Altitude – Your attitude colors every aspect of your life. It is like the mind’s paintbrush. Having a positive attitude is essential. It not only determines your level of containment as a person, but it also has an impact on how others interact with you. Involved in Sales or Leading Others? Interested in less rejection? More cooperation? Better results? Of course you are! That is why we have a program that helps boost your effectiveness with people through understanding yourself and others. This resource is ideal for anyone involved in sales or direct sales where success with people is vital. 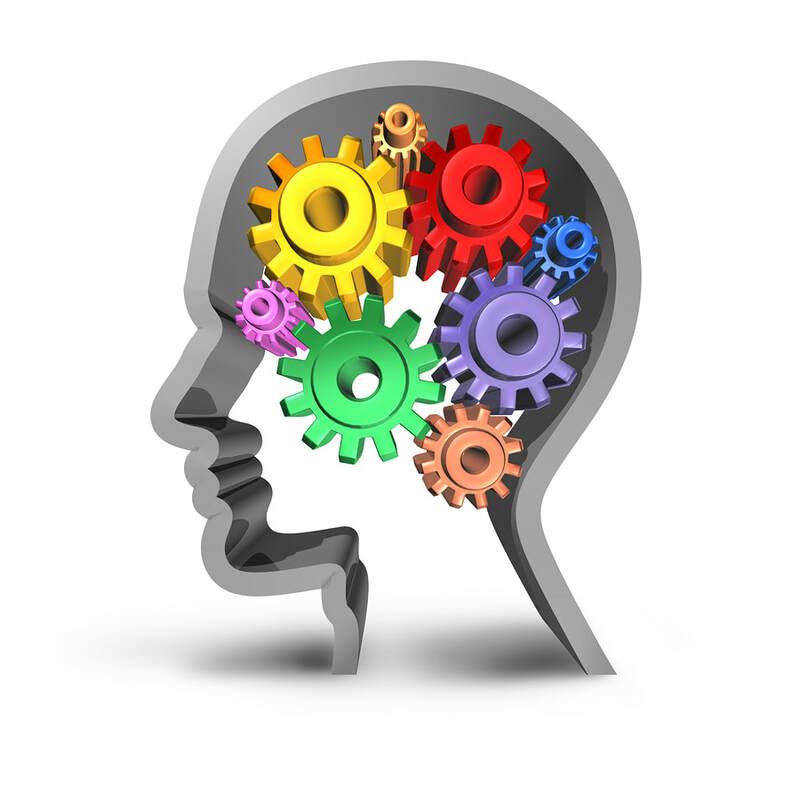 Insights into how people make decisions so you can work with their personality and more! Barbara Britt has developed a Roadmap to College Success Preparation Program that is helping parents and their children prepare financially, academically, and emotionally for one of the most important times in their family’s life. During the teen years many young people will have more expendable wealth than any time in the future. Where is that money going? How can we manage it so that the college years are paid for? Do you want to succeed as much as you want to breathe? How you see yourself and how you see others can and will determine your success and happiness. Take control of who you see in the mirror. You are worth it! Networking means making sure your have at least a 1,000 connections before leaving high school for college. Invest in building relationships that can pick up the phone and vouch for your integrity, loyalty and work ethics. Has self-doubt started to take hold of your future? Are you living on the past experiences? Failure or past hurts can be the catalyst for your future, no quick sand that holds you back. Why a portfolio in High School or College? Get on the fast track to all your requirements for success. Cover Letters, Resumes, Essays, Recommendation letters, Referrals, Body of Work, Community Service (which stays with you for a lifetime), Essays, and Applied Scholarships. Do you have this tool at your service? Do you know the strategies to help your child have a successful college experience? And do it without running up a huge student loan debt? Ask about the next Roadmap to College Success Workshop. 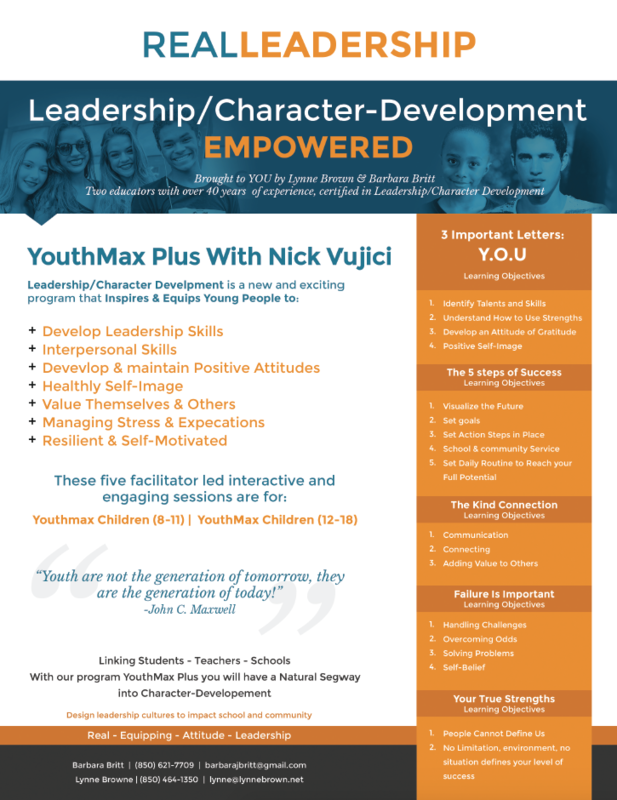 ​YouthMAX Plus with Nick Vujicic is an exciting new youth leadership program from the John Maxwell Team, featuring John Maxwell Team YouthMAX Plus Ambassador, Nick Vujicic. Youth Max Plus – No matter what age we can always learn to be kind. 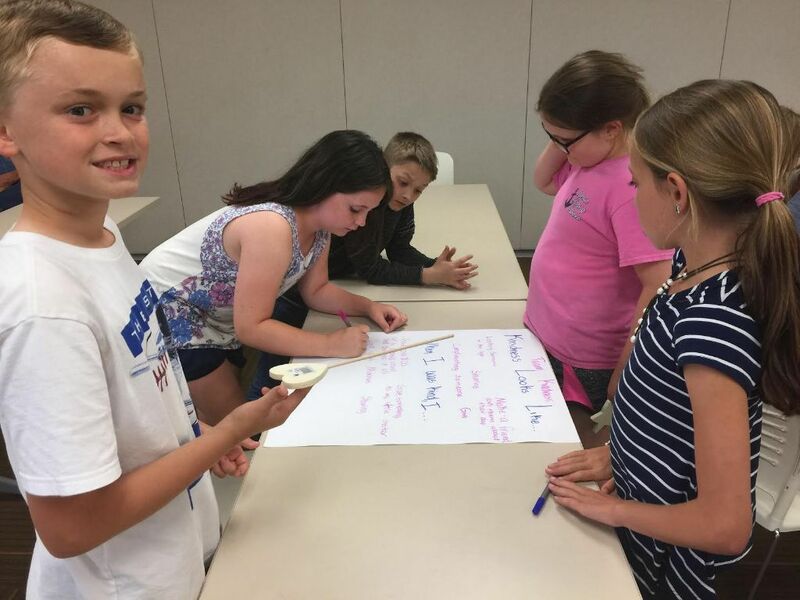 These 3rd and 4th graders from Boys and Girls Club in South Walton did. 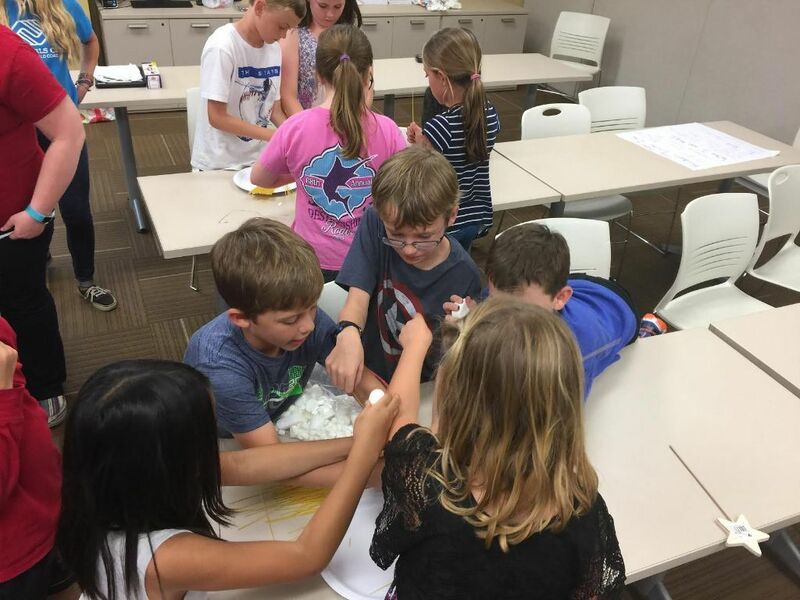 They made kind marshmallow people, then wrote out a description on what kindness met to them.